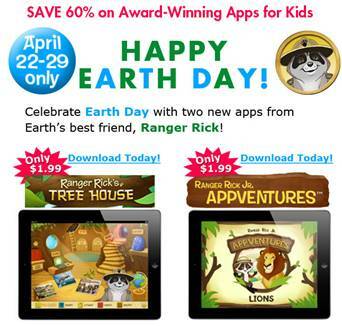 Ranger Rick Jr App - Go on a Wildlife Appventure! You are here: Home / Apps / My Kids Went on a Wildlife Appventure! My Kids Went on a Wildlife Appventure! My kids love to learn about animals, so when we were offered the chance to review the Ranger Rick Jr. Appventure, we took it! My kids were able to go on a wildlife appventure to Africa! 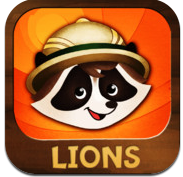 They explored wildlife photos and stories and played educational games and puzzles on the iPad. We still have a lot left to explore in this Award-Winning Kids app. Ranger Rick Jr. Appventure is fun for kids ages 3-7. 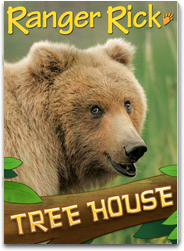 Older kids (7-12) can subscribe to Ranger Rick’s Tree House digital magazine and interact using the Ranger Rick’s Tree House app. Both of these apps are on sale this week at iTunes only for $1.99 each (regular price is $4.99 each). How fun and great timing with Earth Day and Spring! My grand kids love to be outside. They were raised with an appreciation of nature and the earth. I know they enjoy these magazines and would like fun games, too. Wow, this app has a ton of cool features! The Animal Piano and Animal Builder sound particularly cool. Thanks for letting us know about the sale price! The Jr One Sounds like a great app I bet my son would love this one. I grew up reading Ranger Rick, I loved it. This is a great intro for kids to respecting nature! Me and my 5 year old love the Ranger Rick stuff. I’ll definitely have to check this app out.